"I believe we have him," said Cornelius. "Oh, he's well and truly ours now," Fritz agreed, "but he's very headstrong; I fear that he might not be a docile instrument." "Everyone becomes docile when they fall into our hands," the doctor affirmed, with a sinister grimace. The modern literary archetype of the mad doctor is wonderfully incarnated in French proto-science fiction by Dr. Cornelius Kramm, the star of The Mysterious Dr. Cornelius, a sprawling saga serialized in eighteen volumes in 1912-13, written by the prolific Gustave Le Rouge, author of The Vampires of Mars and The Dominion of the World. Dr. Cornelius Kramm and his brother, Fritz, rule an international criminal empire called the "Red Hand." 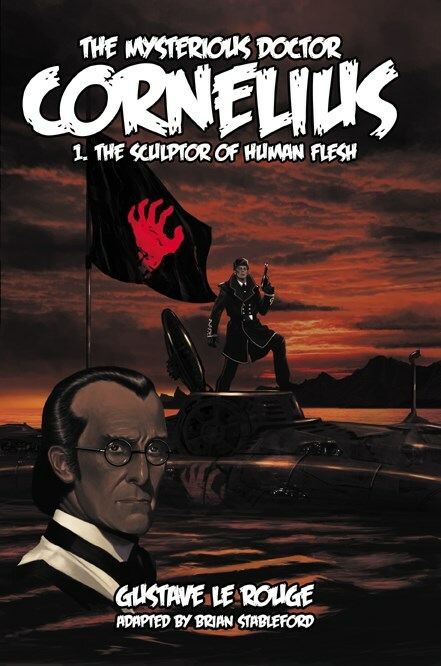 Cornelius is a brilliant surgeon, nicknamed the "Sculptor of Human Flesh" because of his diabolical ability to alter people's likenesses through the science of "carnoplasty." He is a cool and calculating man, always scheming, always in control, who enjoys his wealthy surroundings in New York and Paris. His brother Fritz is more of a henchman, a man of action, who rules the Red Hand with an iron fist. One of Cornelius' top agents is the evil Baruch Jorgell, the son of millionaire Fred Jorgell; Baruch is a sadistic sociopath, who likes to electrocute his victims. Cornelius used his surgical prowess to change the face of Baruch Jorgell, making him unrecognizable. Cornelius' growing, global, evil web eventually causes the creation of an alliance of heroes, who band together to fight him and, ultimately, defeat the Lords of the Red Hand. These heroes are: Dr. Prosper Bondonnat, an equally brilliant French scientist, biologist and botanist; American billionnaire William Dorgan and his son, Harry Dorgan, who is also in love with the beautiful Isadora Jorgell, Baruch's good-hearted sister; and finally British Lord Burydan, a colorful, freebooting adventurer. Gustave Le Rouge (1867-1938) was one of the authors who most embodied the evolution of modern science fiction, moving it away from the juvenile adventures of Jules Verne by incorporating real people with real emotions into his stories, thus bridging the gap between Vernian and Wellsian science fiction.